Ben Silbermann, CEO of the visually focused network Pinterest, unveiled a series of new tools at a press event in San Francisco this week. Known as “Place Pins”, these new tools allow Pinterest users (or “pinners” if you’re feeling colloquial) to explore locations, and plan trips by creating location-based pinboards. The smartphone-based version will also enable users to keep track of these locations while they are travelling, thanks to technology from Foursquare and Mapbox. And while there are no monetisation plans attached to the new function at present, it is highly likely that Pinterest will help local businesses promote themselves by linking them to place pins. If a new proposal from the FCC goes forward, US airline passengers may soon have access to calls, texts and data mid-flight. It’s more or less common knowledge nowadays that phone use on planes is less an issue of safety, and more one of manners. According to the Wall Street Journal, wireless communications already exist onboard, but are currently illegal. However, if this proposal does become a reality, it will be at the discretion of the airlines to determine what is appropriate mobile phone use. It will probably be a long time before these new conditions reach British travellers, so you needn’t worry about any loud and incredibly public telephone conversations on your next RyanAir or EasyJet flight just yet. The six second video app has branched out, launching global versions in 19 new languages this week. The iOS and Android versions of Vine will now be available to download in Danish, Dutch, Finnish, French, German, Indonesian, Italian, Japanese, Korean, Malay, Norwegian, Portuguese, Russian, Spanish, Swedish, Simplified and Traditional Chinese, Thai, and Turkish. Android users will also be able to download Filipino and Polish editions of the app. This expansion, coupled with recent upgrades which allow users to more effectively edit their videos, is most likely an attempt to fend off competition from Facebook-owned rival Instagram. And it may just do the trick; Vine already has a vast and loyal user base (primarily in the USA). Perhaps lightning will strike again in Brazil or Japan. 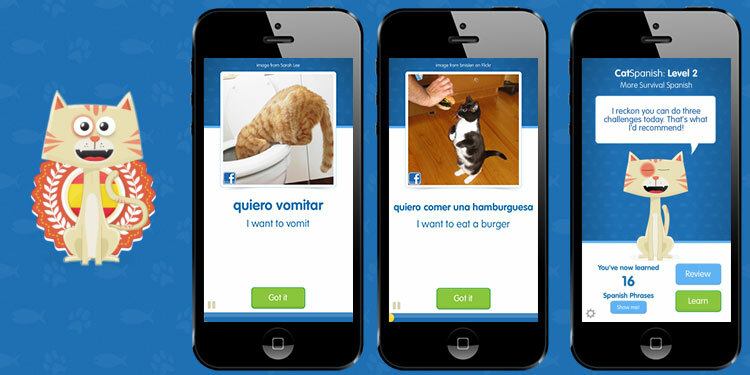 Memrise has launched a new app for learning Spanish, using that viral mainstay – cute cats. Designed to “make your species less dumb”, CatAcademy uses visual cues (i.e. images of cats in various situations) to help you learn Spanish phrases which start out fairly simple and then become increasingly complex. If visual learning isn’t your cup of tea, then another language-learning start-up might be for you; Verbling uses an immersive web-chat approach to connect learners and native speakers in different languages. Download CatAcademy for 99p from the App Store, or login to Verbling at verbling.com.